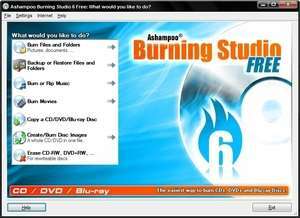 Ashampoo Burning Studio FREE is a suite of comprehensive burning tools which support CD, DVD and Blu-ray discs. Its Blu-ray support supports layers of up to 25 gigs. The recording supports the recording and copying (cloning) of discs. While the first option of the program is to gather a collection of files to burn to DVD, CD or Blu-ray, you may also do that between discs -- under the option "Copy to CD / DVD / Blu-ray". Version 6.84 is a freeware program which does not have restrictions and it's free so it doesn't cost anything. For security reasons, you should also check out the Burning Studio Free download at LO4D.com which includes virus and malware tests. Additional screenshots of this application download may be available, too. 4.5 out of 5 based on 63 ratings. Burning Studio Free download been highly rated by our users.